One of the well-known causes for pancreatitis is when an animal eats a fatty meal. The condition normally starts fairly shortly after the animal has eaten such a high fat meal and requires urgent attention. Overweight patients have also been shown to be more at risk than those with a lean body weight. Conditions, such as shock or kidney failure that compromise the blood supply may also predispose the patient to developing pancreatitis. Certain drugs and some diseases such as tick fever or Babesia (Biliary) in dogs have been associated with causing pancreatitis. In many cases, the underlying cause cannot be found and this is described as idiopathic. Some small breeds, such as the miniature schnauzer have been found to be more prone to developing pancreatitis than other breeds. 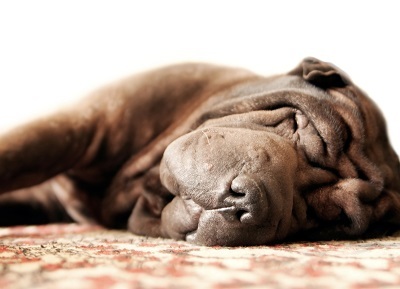 Pancreatitis can affect any age or breed of dog or cat. Dogs may not show any obvious pain until the abdomen is felt and examined. In these cases they will pull the stomach muscles together when you touch the underside of their belly or flanks and they may even groan or try and bite when you press too hard. Cats may also show signs of dehydration, decreased body temperature, jaundice, fever and abdominal pain in severe cases. Cats are generally more subtle at showing disease compared to dogs so clinical signs in early stages may not always be seen. Acute pancreatitis can be very severe, causing collapse due to a drop in blood pressure. This drop in blood pressure may cause extensive damage to vital organs such as the liver, kidneys, heart and blood vessels. Blood tests. Apart from some general blood tests which may point to Pancreatitis there are a number of bloodtests which specifically test the pancreatic enzymes. These tests are very useful. Some of the tests are readily available but for others the vet may need to send blood to an external lab which may delay the diagnosis. In most cases if the vet suspects pancreatitis, even before the diagnosis has been confirmed, the vet will most likely start treatment on the suspicion of pancreatitis given the clinical signs and history. The reason for this is that acute pancreatitis can deteriorate dramatically over a number of hours leading to death. Therefor no time should be wasted in starting treatment. In some cases the veterinarian may be required to do an operation and do exploratory surgery of the abdomen and take samples of the pancreas in order to confirm the diagnosis. In cases where the cause for pancreatitis can be established, that will be removed or treated with supportive treatment provided for the organ itself. Because the cause of the pancreatitis sometime remains unknown the treatment protocol then focuses on providing supportive care. In most cases the veterinarian will advise putting the patient on a drip to provide intravenous fluid therapy. The patient will need anti-nausea medication to stop the vomiting. Often if the patient is vomiting, they will not want to eat any food for the first day or two. If the patient does want to eat, a low fat diet is recommended. In very severe cases and where available, patients may need feeding by a tube or intravenously. Pain control is very important as these patients are generally very sore. Opioids, which are drugs like morphine, provide very good pain relief. Antibiotics are not always required but if the patient is showing evidence of infection, it will be administered. Some patients may recover quickly from pancreatitis but in most cases recovery takes five to seven days. Some severely affected patients may take several weeks to recover and some unfortunately may not survive. In some cases, the veterinarian may advise referring the patient to a specialist facility that can provide 24 hour care for critical patients because this condition can easily deteriorate to such a point. What happens when your pet goes home? Your pet will be released from hospital when the veterinarian is happy the vomiting has stopped and the animal appears more comfortable. Generally they will appear brighter and less depressed. Home treatment will depend on how sick your pet was, but it may include some form of pain medication and antibiotic treatment. Dietary changes play an important role and a low fat diet is essential. There are a few commercial diets available which the veterinarian may prescribe. Feeding small meals frequently is often recommended and the low fat diet will reduce the work load on the pancreas, hopefully reducing the risk of the condition developing again. The diet will also help in weight loss with those pets that would benefit from it. Some animals with severe pancreatitis may lose some function of the pancreas and this may need to be treated accordingly. Unfortunately, some patients may develop recurrent pancreatitis, even with appropriate diet changes and weight loss at home.